Two legends, both alike in dignity: Tosin Abasi, and Brian Wampler, have teamed up to design a pedal suited to the needs of progressive metal guitarists. The result is the new Abasi Pathos, a dual-channel pedal inspired by the sound and feel of a tube amp, and voiced to handle down-tuned and extended range instruments. Volume: controls the overall output level. Think of this as the master volume control. In true Wampler fashion, the volume control has a substantial amount of volume on tap. Extra headroom is always a good thing, especially with distortion/overdrive/boost pedals, where the extra bit of push can make all the difference. Gain: allows you to dial in just the right amount of saturation. The wide sonic range delivered by this knob reflects that of a good tube amp. With the gain set low, the Pathos generates the slightly pushed crunch sound of a tube amp on the edge of breakup, or like a high gain amp head on the so called “clean” setting. At full crank, the gain knob delivers a lot (like, a lot) of distortion. 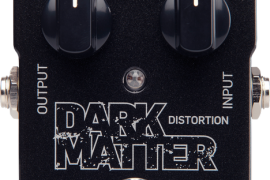 At this point the distortion even becomes slightly fizzy, but not in a bad way…think black metal, or even Dimebag tones from Cowboys From Hell. Between the 12:00 and 4:00 positions lies the sweet spot of the Pathos’s gain control. 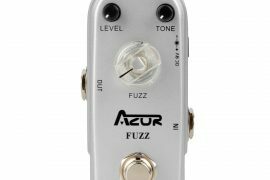 Set the knob somewhere in this range and brace yourself as you tap into a slightly compressed, very responsive, and intricately voiced distortion…you know, that sound, the sound of modern metal. Bass: controls the amount of bass. Given that this pedal was designed by Tosin Abasi, it seems safe to assume that it was made to handle extended scale and down-tuned guitars. Appropriately, the bass knob sweeps across a broad frequency range, and allows for some very precise tightening of the low end. South of about 9:00 gets you some crisp, djenty tones, while turning up the knob introduces more presence in the low end. It is worth mentioning that even when the bass knob is maxed out, the pedal never becomes woofy, but somehow stays focused enough to avoid being unusable. Now, we don’t know why you would want that much bass presence in your signal, but it is nice to know that the Pathos is ready to adapt to a variety of rig configurations. Mid: controls the amount of mids. In some ways this knob is the most important of all of the controls on the Pathos. Modern progressive metal has led the charge in bringing mid frequencies back into the metal world, and let’s face it, you can’t really djent without a healthy dose of upper mids in your guitar signal. With the mid knob set at the 12:00 position, the overall EQ character of the Pathos sounds just slightly more midsy than “neutral,” so you could say that the inherent quality of this pedal is slightly mid-forward. Despite this voicing, the back half of the mid control is quite functional, and will easily yield you some pretty extreme scooped tones that would make the most dedicated of thrash fans sweat. We’re talking full on Testament, Coroner, Pantera, etc. On the right hand side of the 12:00 position, the mid knob goes from modern metal, to djent, to Guthrie Govan-esque fusion, to cocked wah, in that order. Past about 2:00 is where the modern fusion, extreme mids forward sound starts to bloom. Past about 5:00 and you are firmly in cocked wah territory, where all of your Michael Schenker/Zakk Wylde fantasies are waiting to come true. Needless to say, the mid knob really brings the heat by providing an impressive range of tones. Definitely more than the average distortion pedal. Treble: is in some ways the most straightforward of the Pathos’s controls. This knob can be used to add some extra edge and presence at lower gain settings, or to round out some of the fizz and attack at higher gain settings. Just as functional as the other EQ knobs, but given the wide sweep of the mid control, the treble knob worked best for us as more of a fine tuning control. A little something extra to sweeten the deal. Voicing (Smooth/Edge) Switch: changes the overall character of the Pathos. Edge mode provides a full-on sound with a crisp attack, well suited to aggressive rhythm tones. Smooth mode, on the other hand, rounds out the signal and delivers a smooth, creamy, yet just as saturated tone that is especially effective for lead work. This is what we have all been waiting for. 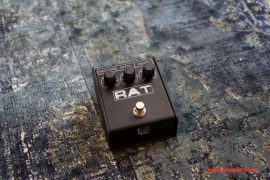 The past few years have seen explosive development with regard to pedals intended to tighten up your guitar’s low end and focus the sound of your instrument to cut through even the densest of down-tuned mixes (you know, all the pedals that have come to replace the TS/OD 808 on every modern metal player’s pedal board). But what about lead tones? Where is the pedal that is voiced specifically for lead playing that is still going to give you the level of dynamic presence that is necessary for modern metal? Right here. The Abasi Pathos. 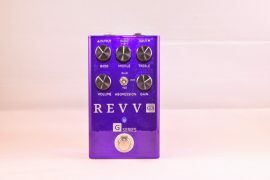 And so, even though the Edge mode provides quick attack, lush dynamics, and clean saturation, what makes this pedal unique and invaluable is its Smooth mode. In general, effective lead tones can be difficult to achieve in high gain settings. Though this might not seem obvious, consider this: how often have you been in a high gain situation, either as a listener or as a performer, and the mix sounded great, but then came time for the guitarist to take a solo, and all of a sudden the lead guitar tone became way too ice-picky in an attempt to cut through the mix, or so rounded out that you had to stop and ask yourself if you were at an Eric Johnson concert, or so soaked in modulation effects as a way of avoiding the other two scenarios that you were unpleasantly thrown back in time to an era in which all death metal solos were accompanied by an unfortunately opaque phaser sound? You see what I mean. And so with the addition of the Smooth channel, the Abasi Pathos has achieved something remarkable and landed firmly within the sweet spot of modern metal lead tones, with just enough compression and high-end roll-off to sweeten the sound, but not so much that your boutique rig starts to sound like a digital modeler from decades past. At the risk of sounding hyperbolic, we would buy the Abasi Pathos just for the smooth channel. To contextualize our experience a bit, we ran our Pathos into the front end of a Blues Jr. amp and got some of the same lush and crushing tones as when we ran it into our cranked 6505. Think about that for a second. Soft touch footswitch: meaning the switch doesn’t click when you step on it. Seriously, why don’t more manufacturers do this? There was a time and place for the clicky switch, but with the ubiquity of LED indicators, the click seems obsolete. Not much signal loss or frequency gouging here. 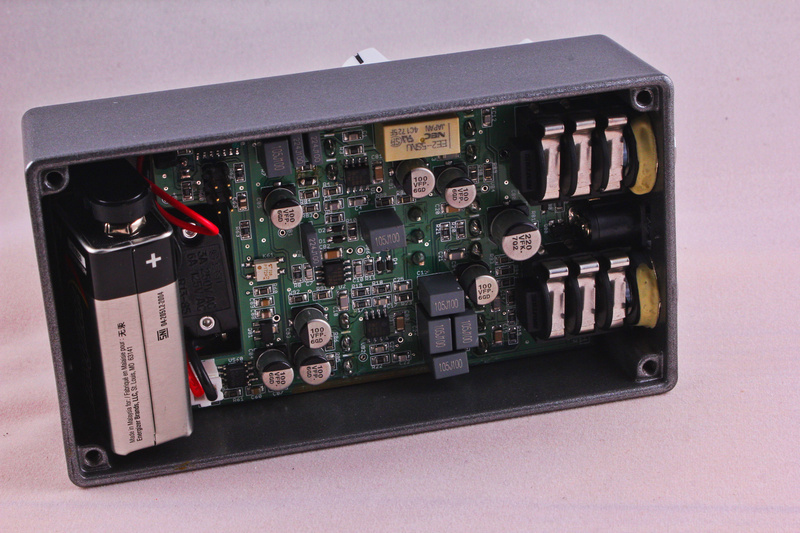 Basically what you would expect from a boutique, true bypass pedal. Lots of gain and saturation across the board here, yet some of the original dynamics have been preserved. Also notice that the increase in saturation has occurred relative to the untreated signal, and so the “naturalness” of the Pathos is on display here. Same settings here, but with the Smooth voicing engaged instead. 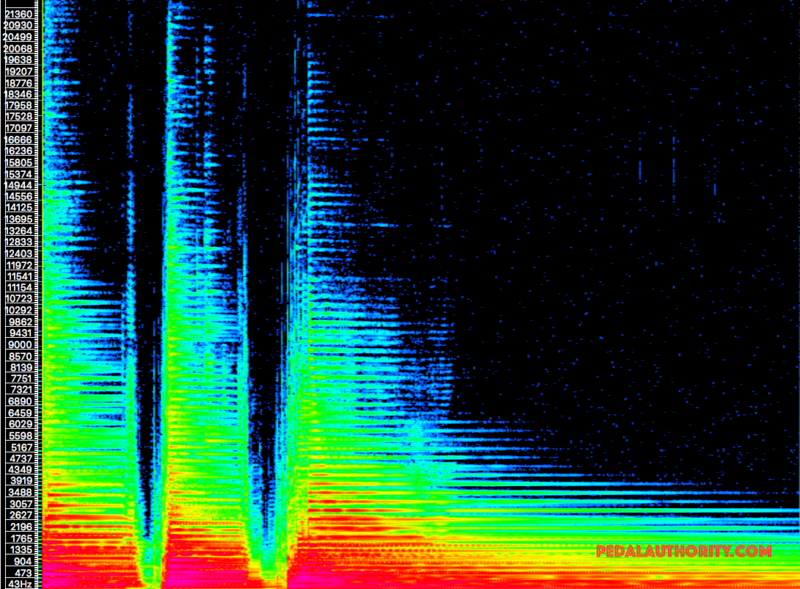 Notice that there is indeed a noticeable middle frequency scoop here compared to the Edge voicing. Here we have the Pathos at its lowest gain setting, with the result being more like a “crunch” sound than full on saturation. Dynamic and crisp is the name of the game here. At the lowest gain setting, we can see that the Smooth voicing also imparts some top end roll-off. Here is the Pathos at full gain, and you can see that there is a lot of presence in the lows and lower mids. 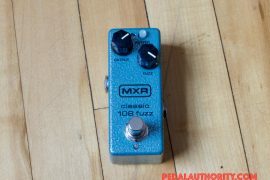 Remember that this pedal was voiced with the guitar’s extended range in mind and diligence has been paid to ensuring that the low end of the instrument’s spectrum has been properly tended to. Again, a noticeable scooping out of the middle frequencies, along with some top end roll-off when the Smooth voicing is engaged. 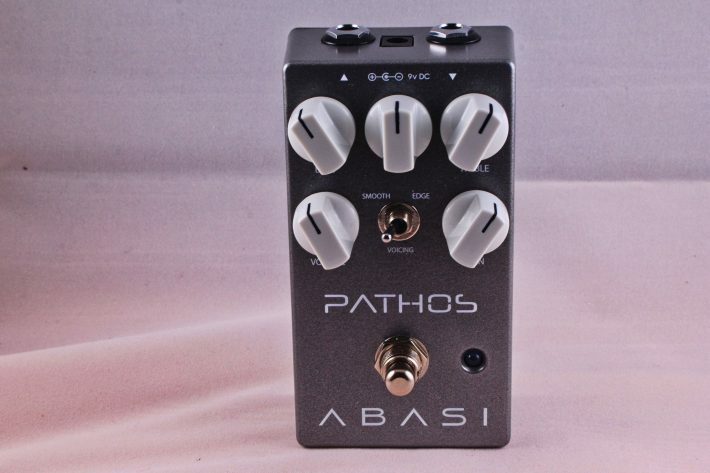 If you play modern metal/progressive metal/djent, or whatever you want to call it, and you are looking for a reliable, multi-voiced pedal, the Abasi Pathos is worth checking out. 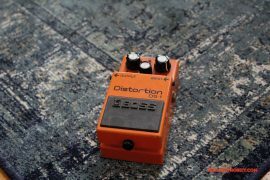 It provides a wide palette of tones with which to work, both rhythm and lead, and at a price point that is still lower than most of the modern metal boost/distortion pedals that are currently available for purchase. 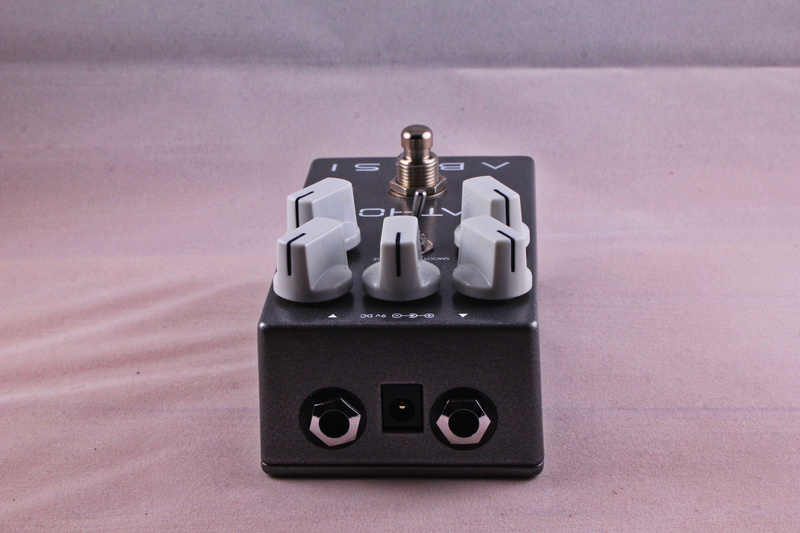 It is also might be the least noisy high gain pedal we have tried. Even with the gain at full tilt, the noise floor (hiss, hum) remains relatively low. And to those for whom this matters, the Abasi Pathos is built in the USA and comes with a three year warranty.